As I crossed the Monongahela River and into the tunnel under Mount Washington, I realized I was entering into a part of Pittsburgh — the South Hills — I’d never seen before. Driving up a steep road into the neighborhood of Brookline, the surroundings were cold, windy and empty — with the exception of three individuals angrily shouting at each other as they walked down the street. And from more than a block away, the steam rising from the hot Las Palmas grill was clearly visible. As a Pitt student living in Oakland, I can say that Las Palmas tacos have formed the foundation of my food pyramid during my time living there. For the past year, I’ve averaged a taco a day from the restaurant’s location on Atwood Street. Some weeks, I ate at Las Palmas every single day. Strangers’ porches surrounding Las Palmas have formed the background for both my professional and personal life, hosting meetings with family, friends and professors. But the Las Palmas in Brookline had a distinctly different atmosphere from the Las Palmas in Oakland. Whereas the Atwood Las Palmas is brightly lit and corridos loudly played from both indoor and outdoor speakers, the Brookline Las Palmas was more subdued and tranquil. At the cash register was Flora Lavernia, a 46-year-old woman who left Cuba five years ago with her husband to find more opportunities and better socioeconomic conditions for her family. Lavernia and her husband first went to Ecuador, later coming to Pittsburgh. She’s worked at the Las Palmas Brookline location ever since she immigrated to the United States. Speaking through a translator, she was quick to emphasize her appreciation for the neighborhood’s quiet and tranquil atmosphere. Pedro Cuobo, 34, worked the grill outside. The Venezuelan immigrated to the United States three years ago. Like Lavernia, Cuobo left his home country in search of better opportunities. He originally worked his way around southern California before ending up working in the South Hills of Pittsburgh as well. Cuobo was never a professional cook but learned cooking through his upbringing. At home, every member of the household cooked, and there was no shortage of opportunities to pick up on techniques. The home cooking background quickly showed — Cuobo grilled thickly sliced steak and onions and crisped up the tortillas so every bite featured an outer crunch met with a flavorful steak filling. 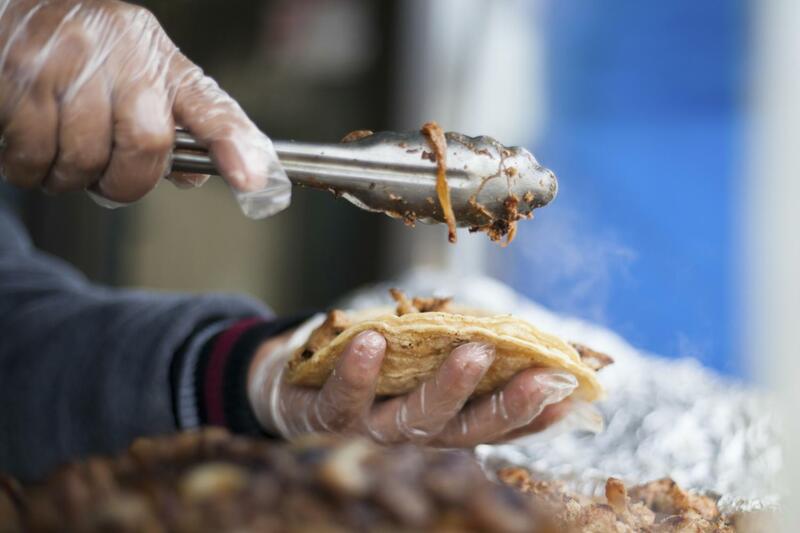 Las Palmas tacos are some of the best tacos to be had north of Texas, but what sets them apart from the rest isn’t just their corn tortillas or grilled meats. It’s their legendary topping selection. The sauces range from spicy to weapons-grade spice that’ll put the fear of God into any yinzer. Las Palmas is particularly renowned for its “green sauce,” a creamy and spicy guacamole much thinner than most guacs found in Americanized Mexican restaurants. No Las Palmas taco is complete without a generous helping of its guacamole — the tub of guac is almost always the first to run out each day. As we went back out the store’s front door and into the chilly, early April weather, I can’t deny I was missing the familiarity of my favorite Atwood location. But leaving Brookline, I realized the neighborhood had a certain sort of charm that the Pitt-dominated streets of Oakland couldn’t claim — the quiet restfulness of an outer Pittsburgh neighborhood combined with a dash of Central American flavor at Las Palmas. Jeremy primarily writes on gun policy and violent crime (and tacos) for The Pitt News. Write to Jeremy at jiw115@pitt.edu.